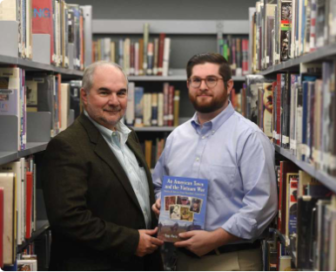 Matt Pavia, a Darien High School teacher, and his father, Tony Pavia, co-authors of An American Town and the Vietnam War, will talk about the book and sign copies of it at Darien Library this Wednesday evening. Looks like authors Tony Pavia and his son, Matt Pavia (a teacher at Darien High School), are checking out the competition. 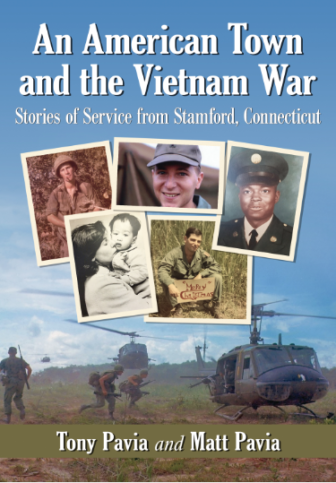 An American Town and the Vietnam War tells the story of the Vietnam War as it was experienced by the young men and women from one “all-American” community of Stamford who left home to serve. The book is also about the families who carried on at home waiting for the return of their loved ones. It also honors the memory of the 29 young men from Stamford who made the ultimate sacrifice for their country. The men and women from Stamford who served in America’s most controversial and misunderstood war came from all corners of town and represented the full spectrum of the nation’s diversity. Barrett Bookstore will be selling copies of the book at the event from 7 to 8 p.m. Dec. 5 in the Community Room of Darien Library. You can also order it from Barrett Bookstore (for price information, email sdbarrettbooks@gmail.com or call 203-655-2712). The book is also available on amazon.com and barnesandnoble.com, and can be ordered direct from McFarland & Co. They were white and black, immigrants and natural-born citizens, working class and affluent. Some had not yet finished high school; others had graduate degrees. They served as grunts and helicopter pilots, battlefield surgeons and nurses, combat engineers, mine sweepers, and support personnel. Greeted with indifference and sometimes hostility upon their return home, Stamford’s veterans learned to suppress their memories in a nation fraught with political, generational, and racial tensions. Now in their late 60s and 70s, Stamford’s veterans have begun to tell their stories. An American Town and the Vietnam War contains “gripping, emotionally wrenching tales by young men called on to fight an unpopular war and then treated like pariahs when they returned,” according to Jack Cavanaugh, Pulitzer Prize-nominated author of Tunney. Tony Pavia is a retired American history teacher and the former principal of Stamford High School, Trinity Catholic High School, and New Canaan High School, and the author of An American Town Goes to War (Turner Books, 1995), which chronicles Stamford veterans’ experiences in World War II. Matt Pavia has taught American Studies and English at Darien High School for sixteen years. The father-and-son team began work on An American Town and the Vietnam War in the summer of 2015 and spent countless hours over the next three years conducting research and interviewing Stamford’s Vietnam veterans and the families of the deceased.